Jane's is Regina's original day spa and has been offering a complete range of high quality spa services for over 39 years. Located just north of beautiful Wascana Park in Regina, Jane's spa has a unique atmosphere nestled within 2 renovated homes built in the early 1900's. With customer service as its forefront, Jane's offers classic spa & beauty treatments, as well as the newest up-and-coming medi-spa procedures. Jane's primary focus is skin care & our expert therapists are essential for quality customized facials, skin care programs, as well as product advice & skin consultations. 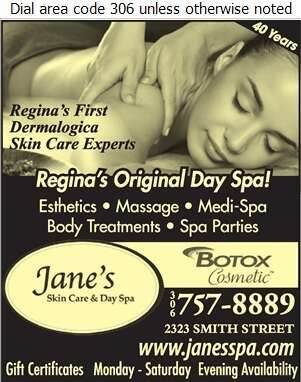 Jane's is Regina's 1st Dermalogica Skin Care Experts.